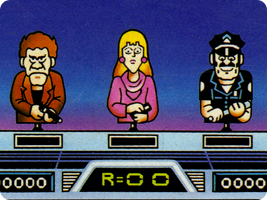 An NES Zapper game based on Hogan's Alley shooting ranges. Test your reaction time by taking out the villains but don't shoot the good guys,	or	you lose. There is also a can-shooting minigame where you are tested on accuracy. Land the can on different platforms to rack up a high score.